Today was one of the best days I have had in Hawaii. Oddly enough, it also falls on the day that I was supposed to run the Kauai Marathon. And given the circumstances, that would be a huge bummer. And it was. It really, really was. But, to take my mind off of the situation, Cathy had a plan to drive up to the North Side of Kauai and spent the afternoon at Hanalei Beach. Happiness is me and a beach. And thanks to my ankle, doing fun beach-y things aren’t easy for me. So, while my roommate gets to paddle around in the surf…I’ve been strolling the beach a little…carefully and slowly…wishing that the currents and waves were a little easier for me to swim around in, but the injury is a little too new at the moment. Sometimes standing on the beach is a struggle. But that was the day. We packed up just before the heavy rains hit and went and grabbed some shaved ice from JoJo’s Shave Ice while waiting for it to lighten up. When it became evident that it wasn’t happening, we decided to go driving to a scenic place to wait it out because dinner was to be up on the North Side. When that looked like it wasn’t going to happen, we opted to drive back down to Kapaa before roads were flooded and figure out dinner somewhere down here. One place we had been eyeing last night before deciding on pizza was this great place called Caffe Coco. 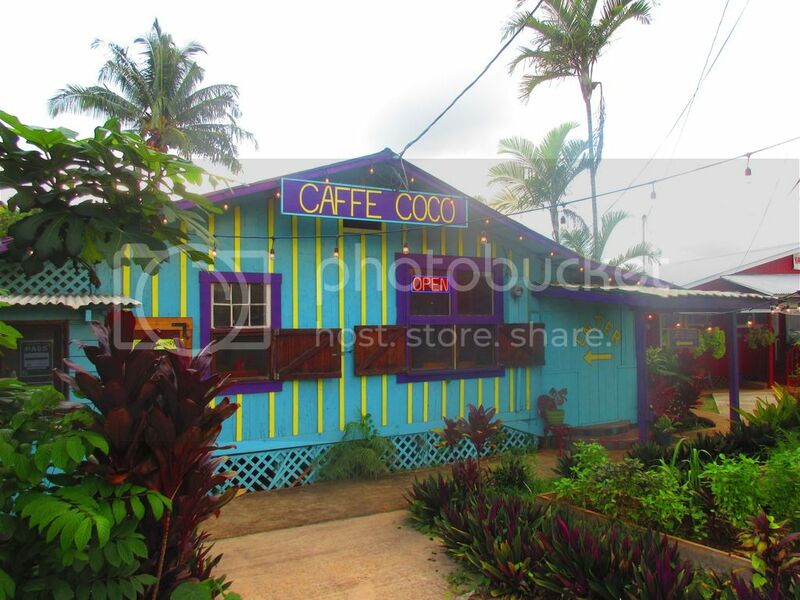 Caffe Coco is a quaint cottage cafe with an outdoor garden setting on the island of Kauai. This adorable little restaurant strives to serve Island grown produce, fresh Island fish, organic chicken, and whatever else that will help support local farmers. LOVE that. This restaurant specializes in vegan, vegetarian and gluten-free. Making it ideal for me. BUT…that being said, they do serve a few dishes that offer a seafood or chicken option. A little something for everyone! We all finally decided that we were a little hungry after assessing sunburns (Jenn and I got nailed today!) and putting some aloe after sun gel on it. Hoping that helps ease the sting and cuts down on the redness. So…we headed out for the short drive down to Caffe Coco, being greeted upon entering and being shown to seats out in their cute garden setting. We immediately loved the quirky, free, hippy-ish setting, the glass that coated the ground and the rustic setting. It was a very happy place for me. We had glasses of water poured while we browsed the menu. And soon, our waitress came over and asked if we had any questions regarding the menu, but by that point, we had it all pretty figured out. So, orders went in. Jenn decided on the Organic Pasta Shrimp Fresca ($28.00) which is organic pasta and shrimp tossed with local tomatoes, basil, white wine, Parmesan, balsamic reduction and served with a green salad and garlic toast. Cathy got the Jamaican Jerk Organic Chicken ($28.00), served with purple sweet potatoes, coconut creamed kale, pineapple salsa and server with a green salad. As for me…I went with two of the Starters listed on the menu. 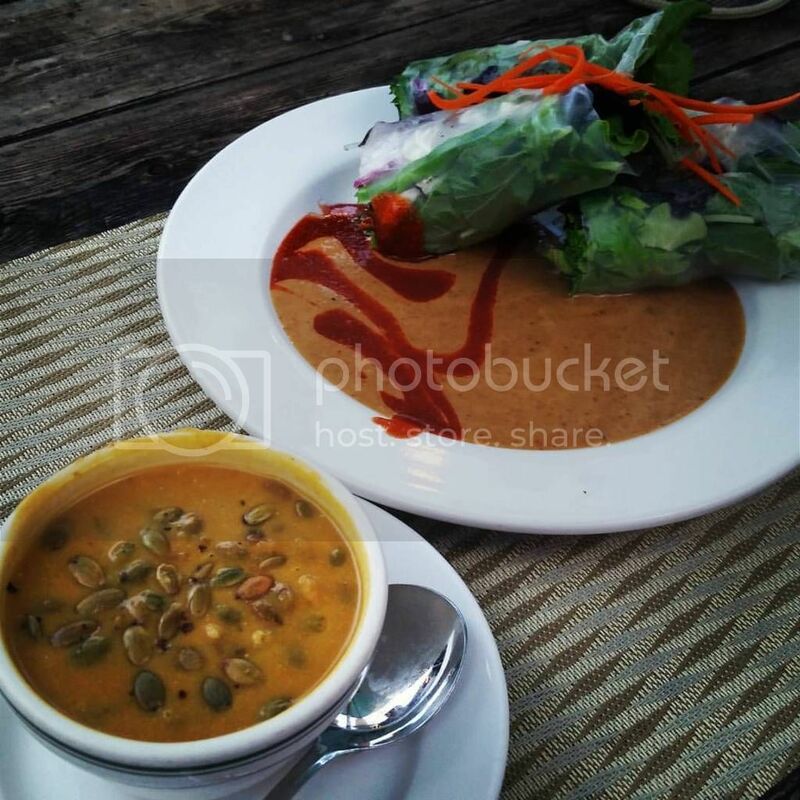 The first was a cup of the Thai Curried Pumpkin Soup ($5.00) and the Vietnamese Summer Rolls ($10.00) with organic greens and a peanut sauce. And after seeing it come out, I also decided to add their Hibiscus Iced Tea ($4.00) to my meal as well. We could see the kitchen from where we were sitting and could hear the fuss with the chefs. Turns out a 20 person wedding party was set to arrive and they were working on getting out food to clear everything down to be prepared for the wedding orders. It was a little chaotic, but everything came out to the waiting tables, and all of it looked great. And soon…ours came out as well. Everything looked and smelled amazing. Jenn’s shrimp and pasta looked amazing…and she said the sauce with the garlic toast was phenomenal. Not to mention, they didn’t skimp on the shrimp, but served her up a perfect number and all a great size. No small shrimp here. No way. 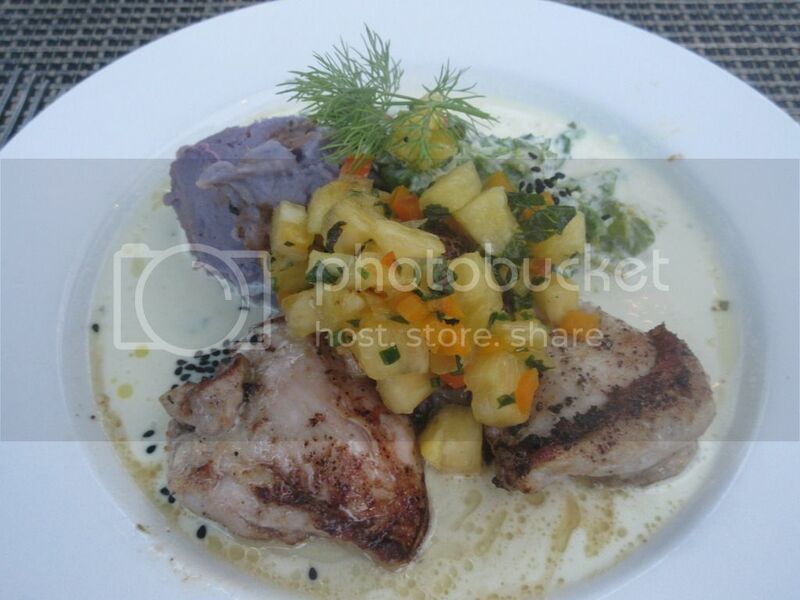 Cathy fell in love with her meal at first bite, but LOVED the creamy sauce that everything was set in. That was her favorite part for sure. But it looked amazing. And colorful to say the least. She said it was spicy without being overly spicy and ‘tasty.” She was in a happy place for sure. As for mine. HOLY COW!! LOVE. Just pure love. I loved everything about each dish. The soup had this rich depth of flavor. I loved the floating pepitas that were resting on top and the various onions and creaminess that came with each bite. Just…YUM!! I ended up saving most of this to the last bite. The Vietnamese Summer Rolls were delicious. Packed with greens laying in this delicious peanut butter and sriracha sauce. You brought me a bowl of peanut butter…I’m now a very happy girl. It paired well with the organic greens and veggies that were stuffed into each roll. And I devoured every last bite…and every last bit of that sauce. This was amazing, delicious food. Happy place…discovered. We were given a dessert list to look at, being told that the pudding was vegan and gluten free…and the brownie and chocolate chip cookie were gluten-free as well. They were out of their homemade ice cream at the moment. We considered it for a brief moment, but decided we were ready to call it a day and we would return to the resort for the Macadamia Nut Hershey’s Kisses we had stashed there. OH…yeah!! That soup was one of the best things I have ever eaten. I was beyond happy and satisfied…and we all left there content and full…without being too full. Love is definitely finding a great place to eat that honestly has a little something for anyone and everyone. And I felt completely comfortable eating there. Even moreso when the check arrived and my order was circled with a note that read: “**Celiac & Dairy Allergy**”. Oh yeah…that was so nice to see. It means they take their customer’s dietary needs to heart. Everything was delicious and we all left happy plates and walked out comfortably full. Feeling good about our meal choice and loving the food we ate. This was one of the best places on the Island of Kauai. It might seem pricey, but the food is worth the stop and the price. You will not be disappointed. I was beyond impressed with service and food. I’d go back again in a heartbeat. Hell, I’d go back tomorrow! This entry was posted in Asian, Clean Eating, Coffee & Tea, Dessert, Dips, Entree, Food, Gluten-Free, Local, Nuts, Restaurants, Review, Salad, Sauce, Side Dish, Soup, Travel, Vegan, Vegetables, Vegetarian by The Celiathlete. Bookmark the permalink.